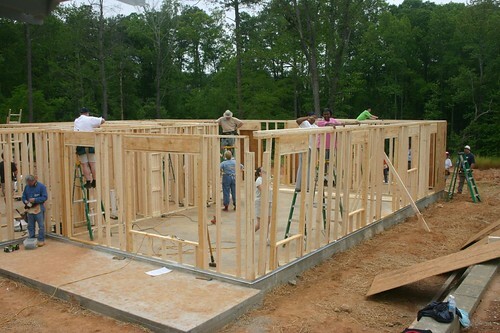 Habitat Build – August 10, 11 – Decoration Day! Hoorah! 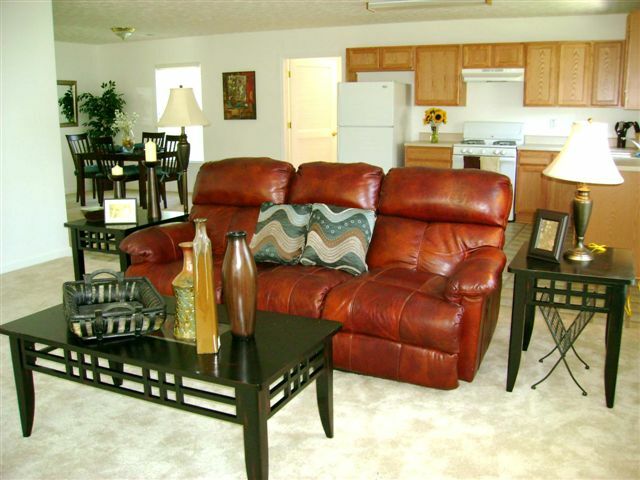 The house is all decorated and ready for Joi Billingsley to move in. 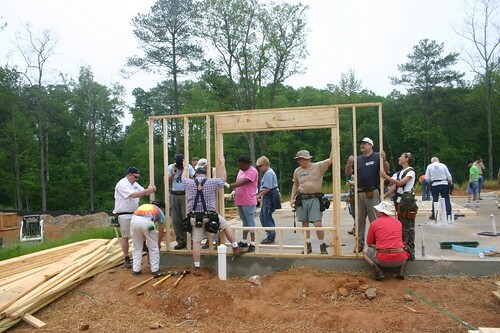 This house was built by the Presbyterian Coalition, Cobb Habitat for Humanity with the help of eight Presbyterian churches in Cobb County, Georgia. 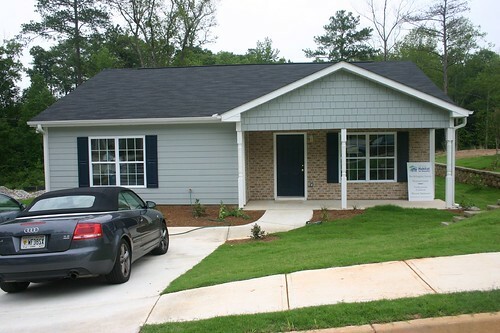 I believe this is our 22d house in Cobb. 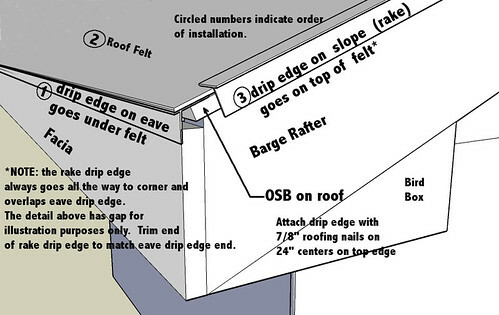 There are a total of 16 articles here outlining the building of this house from the slab to finish, including dedication and decoration. With that there are 11 slide shows. 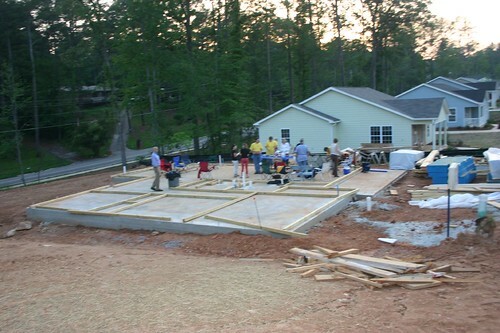 We still have a few fund=raising efforts to accomplish this year to help pay for next year’s build. 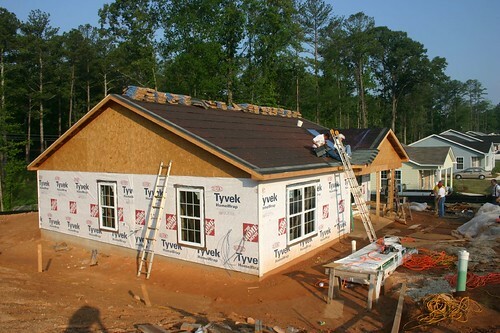 In addition to this house, we are financing the building of 6 houses in Kenya this year. You can click here to select the 16 articles and slide shows all in one place. Pretty as it is from the outside, wait until you see what Georgia Home Staging did for Joi inside! 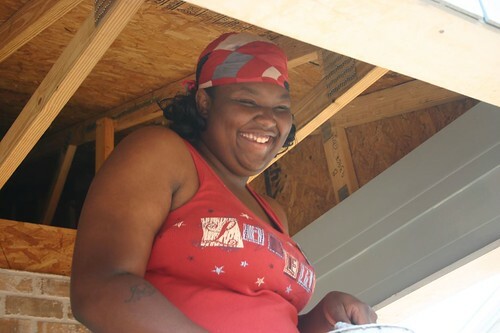 If you came in late, Joi lost all her furniture to thieves that broke into her storage locker one weekend while she was working on her new home (sweat equity). 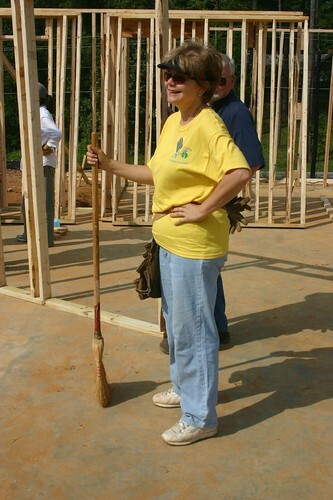 Pat Shankle of Georgia Home Staging had already offered to stage (decorate and arrange) her house, and decided to help find donations to refunish it. A member of Macland Presbyteran Church donated and arranged for the bulk of the furnature, including decorations, lamps and artwork. Other donations of money and goods poured in. 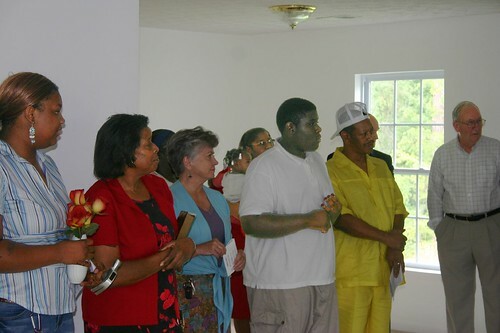 With the help of donations, including a whole household of furnishings, Pat Shankle of Georgia Home Staging, Margret Kendall, and others from Macland Presbyterian Church finished staging and dicorating Joi’s new home. Everything new all around. 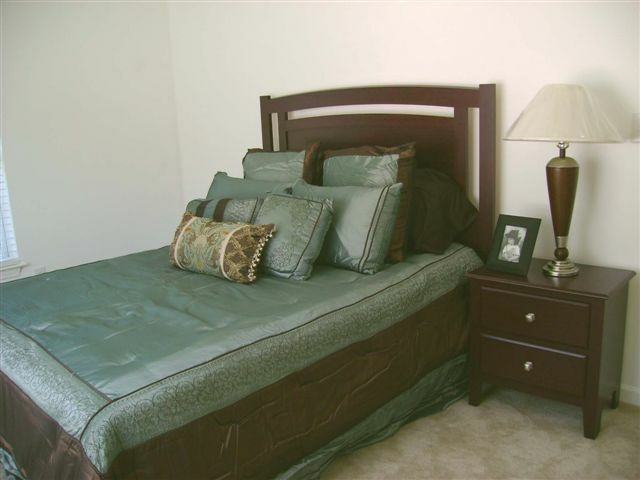 Margret on the left and Pat adjust a picture in the guest bedroom. They made me promise not to use this photo, so don’t tell them about this site. The rest of the photo’s below came from Pat’s camera. There are a lot more shots from both of us in the slideshow below. 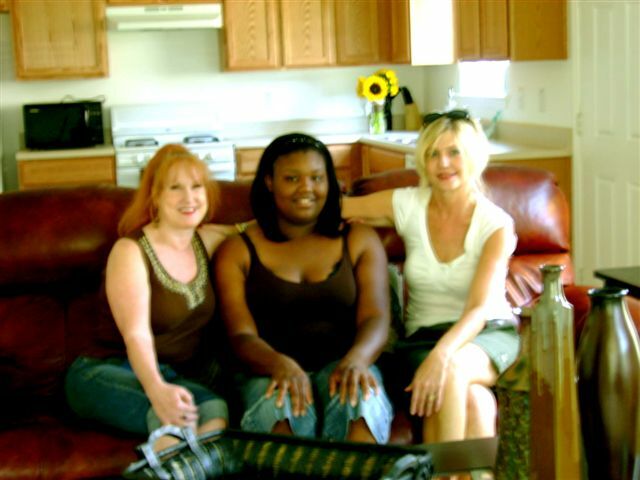 Margret, Joi, Pat enjoying a chance to sit down in Joi’s new home. I’ve never seen Joi not smiling. See – even Margret and Pat are catching it! 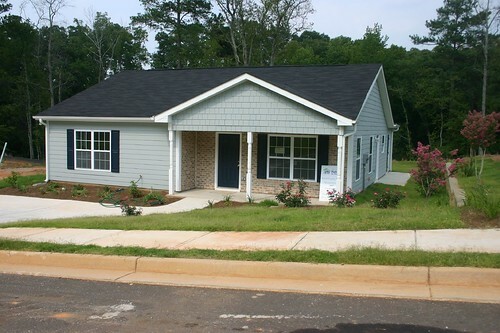 Habitat Build July 15 – Dedication Day! 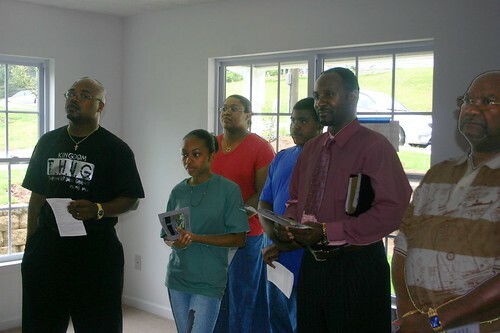 Today was Dedication Day for Joi’s new home. 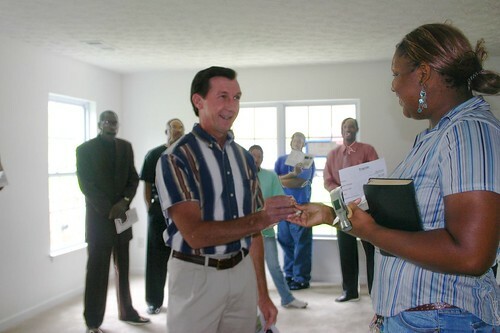 Dedication day is when we dedicate the house to the Lord and turn over the keys to the homeowner. She gets a hammer, some gifts, and a Bible as well. Plus lots of good will. Every body loves her. The house is ready, and there are no known issues. She is not quite able to move in yet, as the Certificate of Occupancy (CO) from the city has not been issued yet – but it is coming. As a matter of fact, it is beautiful. One of the prettiest and blemish-free houses I’ve ever had the pleasure of working on – a reflection of the beauty of Joi’s smile. Partly also because of the eagle eyes of Jeff Vanderlip and Jim Miller any and all potential problems were caught early and immediately corrected. 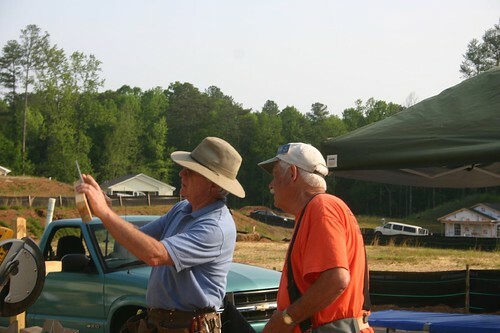 Jeff is our official Site Project Manager (SPM) and Jim is our honorary SPM. 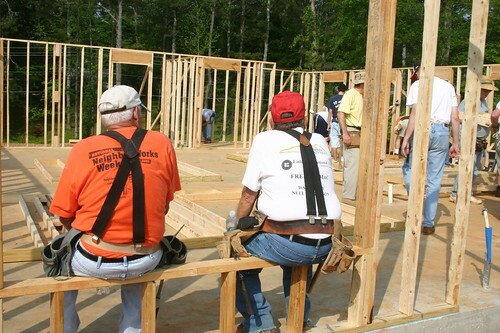 Together they have probably built as many Habitat houses as anyone else in the world. The picture above is the front cover of the program used for the dedication. The inside and back are in the slide show. 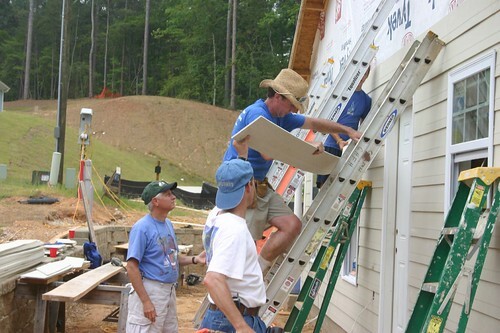 The slide show has 44 pictures, including the complete dedication cerimony and pictures of all the guests and the President of Cobb Habitat for Humanity John Kerwood. You simply have to go to one of these dedication events to hear the wonderful “Amens”, “Praise the Lord”, and experience for yourself the Holy Spirit at work. Pictures do not do the wonder of this experience justice! Enjoy. Simply click on any picture to see the slide show. If you are interested in downloading or obtaining a copy of any photo, click on the link above the slide show and you will get a montage of all the pictures. Click on any one of these and you will get a larger one. Or click on “details” to see larger ones of all of them and you can also comment. To get a full size photo (highest resolution), you need to click again until only one photo is shown, and then look above the photo for “All Sizes” (find it above the photo). Downloads are free and you can print them at home. Flickr has a copy service that allows one hour pickup at a nearby Target store at very reasonable prices if you need a print from a retail store, or you can have it mailed to you. You can click on “Order Prints” which is located to the right of the “All Sizes” link. There will be a number of choices and options where you can add prints to a “shopping cart”. Eventually you will get to a page where you can select Target pickup or have them mailed to you. Or you can cancel, so if you want to know the costs, just pick one and take it to checkout, then cancel at anytime – empty your cart if you think it is unreasonable. 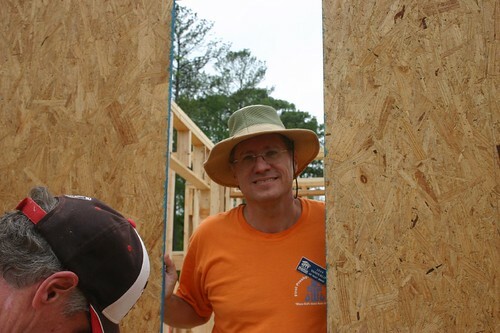 Habitat, the Presbyterian Coalition, and I get nothing but the pleasure of presenting these for your photo album. 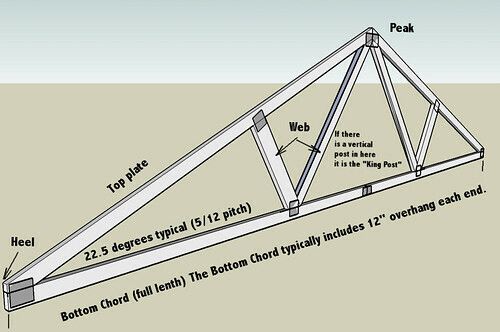 There are 15 posts describing the construction of Joi’s house. 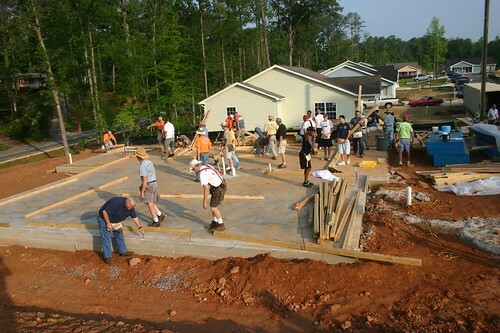 To see all the Habitat posts and all the slide shows, click here or on the link on the right, labeled “All Habitat For Humanity Articles.” and this site will pull them all together for you. No need to skip around. 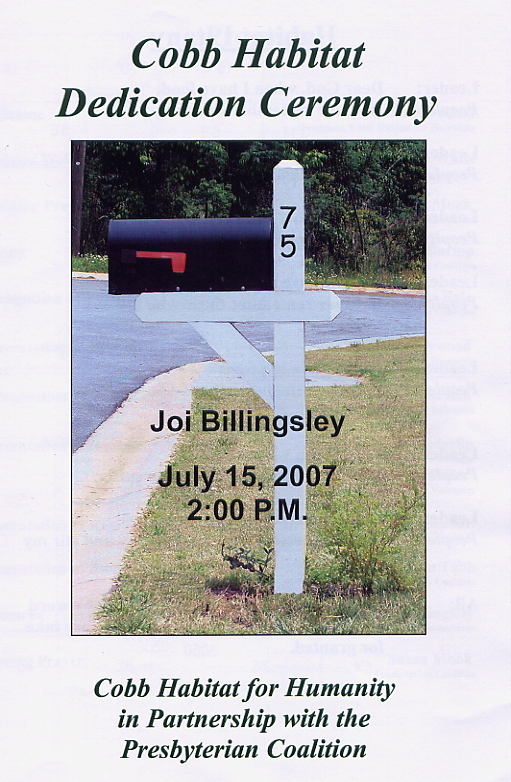 There are 10 sets of photos for Joi’s homebuilding (day by day) gathered into a collection. To see a collection of all the Habitat photos for the 2007 build of Joi’s house on one page where you can select, view, download, copy or view a slide show of each day, click here – Collection of Habitat Photos . Finished house, soon to be Joi’s home. 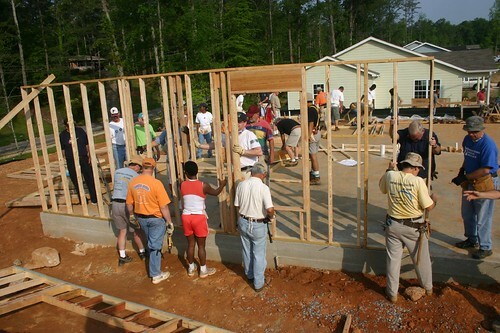 This house was sponsored and built by the Presbyterain Coalition of Cobb County (GA) with the help of numerous church and other volunteers and the constantly smiling Joi. 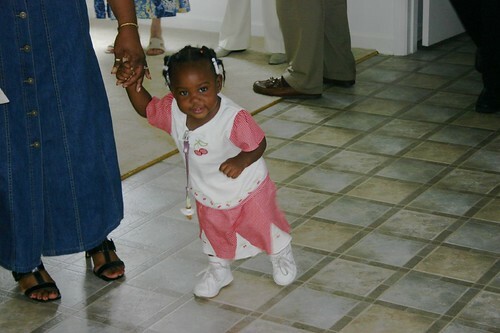 Smallest Guest – Isn’t she a beauty! Wonderful. 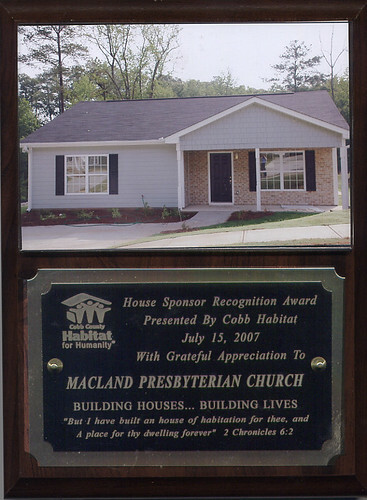 Sample of the plaque given to all the churches by Cobb Habitat for Humanity.This one happens to be my church. Nice touch. We have a bunch of them hanging on our walls. 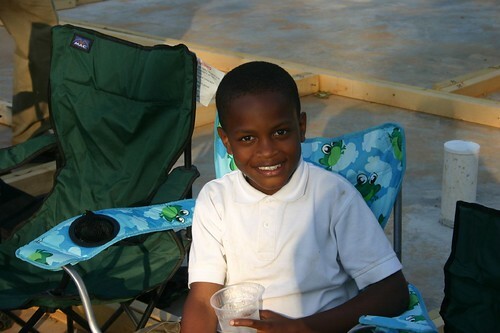 To see the slide show and more pictures, click here or on any of the pictures above. The ones below don’t link. Joi – try to smile once in a while! Isn’t that a pretty smile? 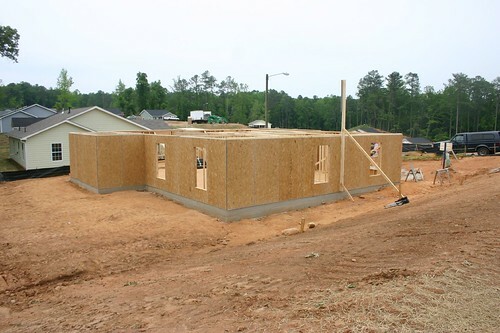 First Day – Show of Progress! That’s Joi in the pink, working. 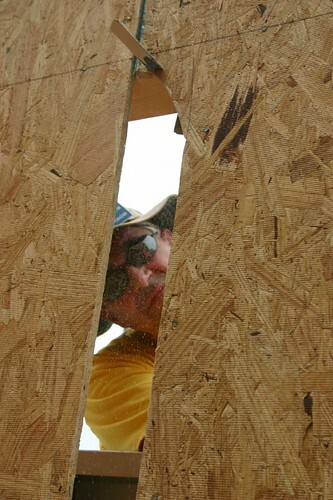 First Wall – Photo Opportunity everyone! 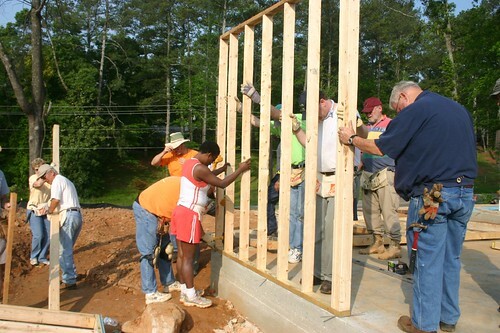 Here is another important link – The Presbyterian Cobb Habitat for Humanity official web site where you will find more pictures and information, and other links. Habitat Build – June 16, 2007 Landscaping Day! 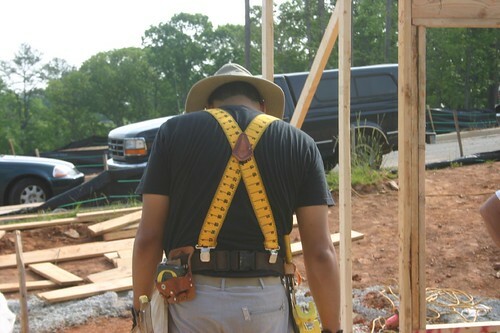 Landscaping is one of the hardest days of a build. It is pure labor. Everyone ends up exhausted and filthy. 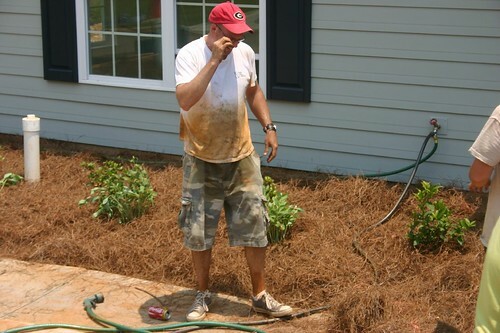 If you look at any of the pictures you will find people with mud or red clay all over. It is the day when there is never enough water and cold drinks to go around. So sooner or later a keg is filled up with ice and we drink the melting ice. Oh, what a blessing water is on Landscaping day. 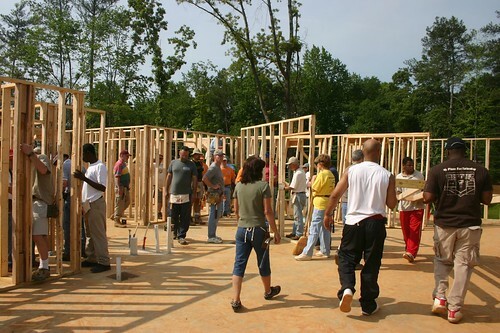 We had about 40 volunteers today. 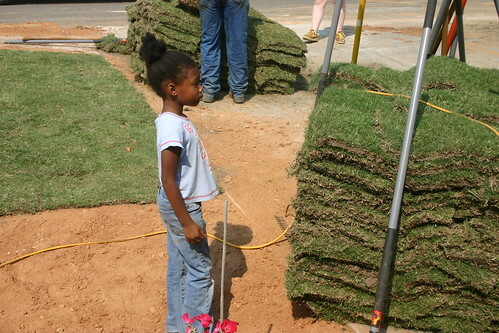 This little girl (see picture above), daughter of one of our volunteers, worked as hard as anyone – she could really move that sod! If you’re too slow, you will be sodded over! We could have used 60, but 40 was just enough. One year we were doing two houses side by side and just plain ran out of steam. Everybody was so pooped it was getting dangerous. 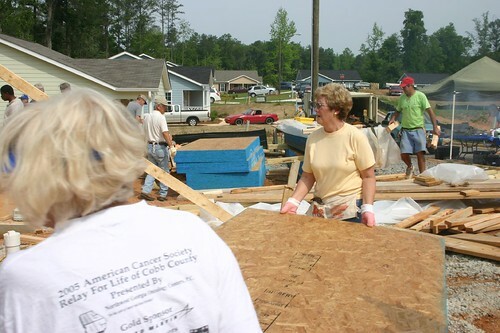 A quick call and a group of Methodists broke loose from the house they were building and came to our aid. “Gotter Done”. 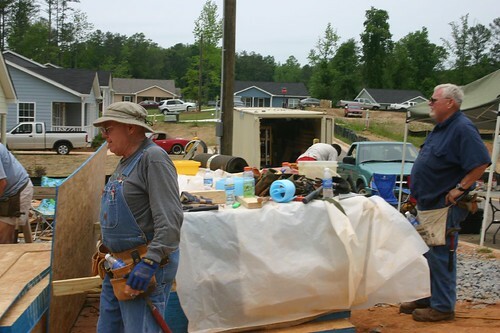 There were a couple of our workers who were sent to do “community service” for some offense or another (not in any of the pictures shown here), but they enjoyed it and will probably volunteer next time – it has happened before. As a matter of note, we are a Christian group, but there are houses going up that are built by Jews, Muslims and secular companies. 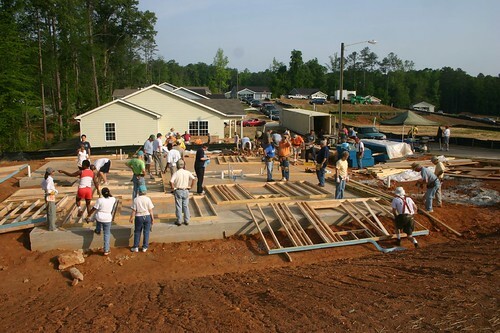 The most unusual local group building houses has three different religious organizations banded together to build Habitat Houses. A Christian Church, a Jewish Synagogue, and a Muslim Mosque. That way, believe it or not, there is a crew working 3 days a week around weekends because they each have a different day to worship. While one group is worshiping, the other two are working. Food, friendship and cultural differences are shared as are the pastoral and devotional duties. Play in the dirt again! 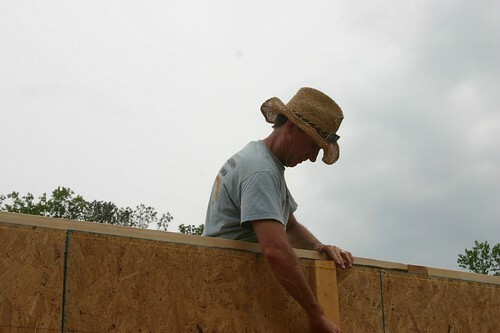 There were long 2×4 boards with 4 ft levels around to make certain that water ran the right way and no pools or rivers formed in the yard, regardless of the downpour. The landscaper that usually starts us off was not there, wanted to be but it was not possible. 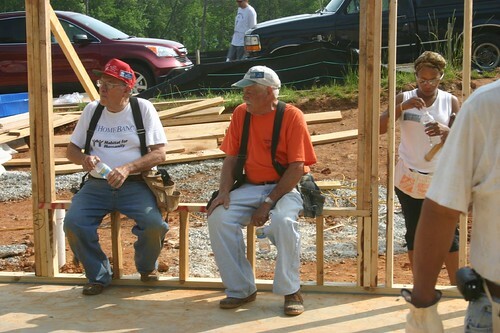 Our Presbyterian Coalition happens to have a Master Gardner on its board and although Terry had been very sick the previous week, he showed up and got us all going in the right direction. The plants were there, and he directed us on how deep and exactly where to put them, and how the ground should flow for best water usage. 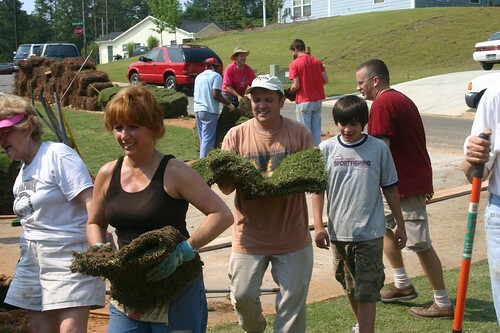 So we raked, toted rocks away, molded the ground, dug holes, planted shrubs, flowers and trees, toted and placed sod and watered. “Gotter Done”. 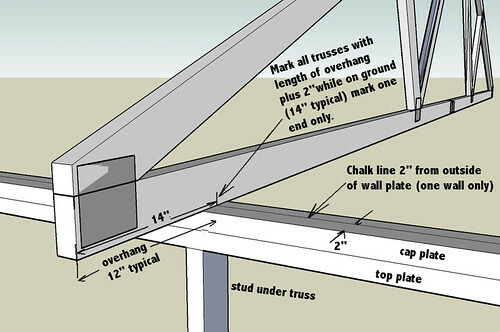 Several worked to get the rest of the soffit and fascia done. The early joke by our SPM was “green side up.” Then he grumbled (good naturally) the rest of the day that nobody appreciated his jokes. The “tweet tweet” bird box was finally covered. The fascia was finally covered, and the Georgia red clay was covered. Red to green, what a transformation! 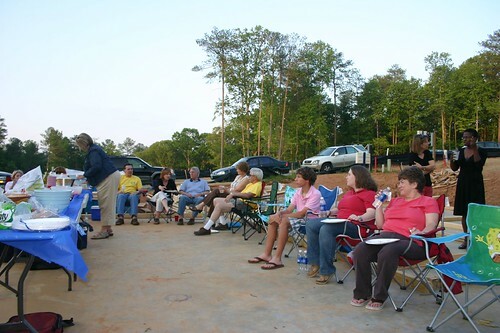 Each church volunteers to serve lunch at least once. 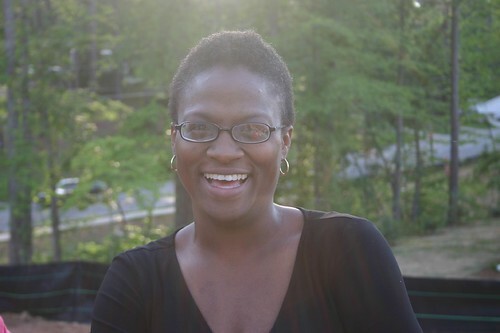 Today was my church’s day – Macland Presbyterian. Lunch varies by church and by who gets stuck with the task of providing food (or sometimes insists). Sometimes it is Subway sandwiches, another time it is Papa John’s pizza, other times it is home-made sandwiches. Whatever it is, it is enjoyed. Every lunch is preceded by a devotional and a request for a blessing. There are pictures of the huge plates of food we had for lunch in the slide show. 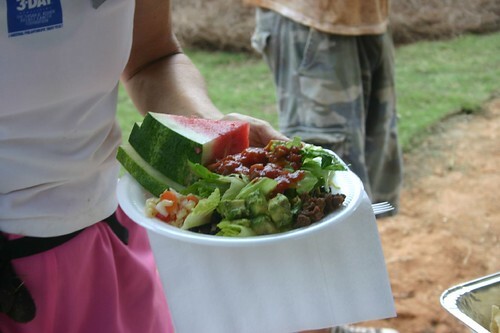 Home – made taco salad with watermelon and home – made brownies. It was cool and delicious. Just right. Across the street the sponsor there, a corporation, had barbecue catered in. William’s Brothers. Too expensive for a church group to have catered, but every time we have asked, William’s Brothers has donated the food. Papa John’s has donated our food, so have several restaurants. Friday’s subways were donated by a woman that happened to be in line behind the person from our group that had volunteered to pick them up. “Are you a missionary?” asked the woman behind. (The shirt said “First Presbyterian Missionary”). “No, I just happen to be getting food for a Habitat build.” “I would like to pay for it!” says the woman behind. After a little “you don’t need to do that…. I want to…, ok, lets split it… no I want to pay for it all..” bantering, she ended up paying for 12 subways and drinks. We don’t even know who she is. Maybe one of those secret angels we hear about from time to time. Done for this year, well, almost done, maybe somewhat done. 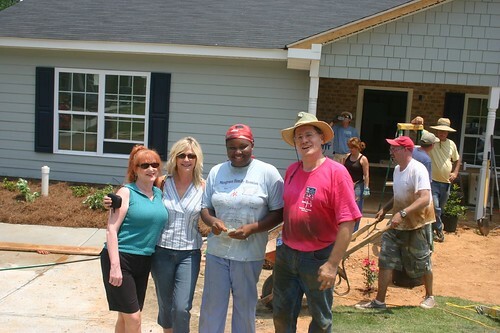 We still have a clean up weekend scheduled next Saturday and a House Dedication July 15. We turn over the keys on that date. 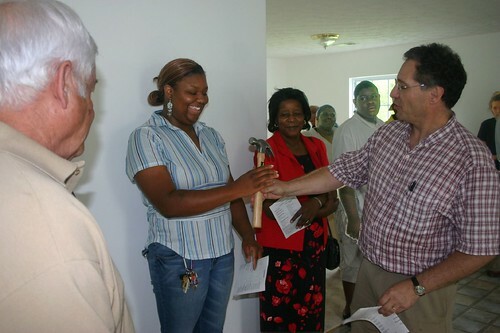 If everything goes well, it will pass inspection and we will get our CO – Certificate of Occupancy so that we can move in all that brand new beautiful furniture that a member of our church donated. Living Room, Dining room, Master Bedroom, Second Bedroom, Office. Washer Dryer and kitchen flatware, pots and pans, glassware, etc. Soon it will turn over from a mere house to a happy home. Visit our Presbyterian Coalition web site (PCCH) through a link on the right. PCCH has links to our churches and to this web site. Here is a link to the slide show for today – Landscape Slide Show, or click on any picture above.